Tues Feb 2nd excavations on Guernsey. Lecture by Dr Ian Kinnes at Hendon Library. Coffee 8 p.m., Lecture 8.30. This is our second attempt at the lecture scheduled for Nov 3rd last year which had to be cancelled owing to an accident to our speaker. Dr Kinnes is Assistant Keeper of the Dept. of Prehistoric and Romans - British Antiquities at the British Museum. He will be well known to many members as a lecturer at their Extramural Diploma classes. His subject will be the Neolithic excavation cn Guernsey which he began in 1979 and completed last year. Sat Feb 13th at 10a.m. Roman Group. An outing is planned to the Bruce Castle Museum, Tottenham, to view a Roman kiln, lifted from Highgate Wood. Please phone Tessa Smith (958 9159) if you wish to come along and for further details, including car pick-up points. Thurs Feb 18th at 8p.m. Documentary Group meeting at 33 Denman Drive NW11. Anyone who would like to join the group will be welcome, but please let Nell Penny (458 1689) know if you intend to come. Mr & Mrs Gregory, New Southgate; Steve Herman, NW1; H N Hesp, Finchley; Mrs Jacques, Garden Suburb; Louise Kenton, NW6; David Lightowler, Hendon; Peter Lucas, Golders Green; Dorothy. Rothstein, Hendon; Tessa Speare, Mill Hill; Nina Turnsek, Finchley, Mrs Tyler, Garden Suburb; Dominic Ward, Hendon; M D Webber, Archway; Stewart Wild, Finchley. We are also happy to have added two more schools to the corporate membership: Holloway School, at which HADAS member Aubrey Hodes teaches and leads an archaeological group; and St James' School, Grahame Park, where long-standing HADAS member Mary O'Connell is a teacher. by the first Committee to April 1 of that year. Our President, Professor Grimes, has as. you know kindly accepted an invitation to deliver the April lecture. To avoid any risk of exceeding the permitted number atterding on April 6th, and our having to turn members away, we have decided to issue tickets for this lecture. These will be obtainable at the February and March lectures, or on application to Dorothy Newbury, 55 Sunningfields Road, Hendon N.W.4. On Saturday, April 24th our birthday party will be held at St Jude's Church Hall; Central Square, Hampstead Garden Suburb. It will be attended by the Mayor of Barnet, HADAS Vice-President Mrs Rosa Freedman. The time has now come to let you into some of the secrets of this exciting event. The evening will consist of a buffet party, during which varied enter­tainment will be offered. Tickets will cost £7.50 including wine. Many members have already enquired anxiously how soon they will be on sale, so possibly they may go like hot cakes. They will be available from February 2nd before the lecture, or on application, with remittance, to Dorothy Newbury 55 Sunningfields Road N.W.4 and will be allocated on a "first come, first served" basis. There is, alas, a limit to the number who can be fitted into the hall and the party will have to be restricted to members only. The Mayor will arrive at 7 pm and other guests are asked to be there bet­ween 6.30 - 6.45. The buffet is to be an historical one and we hope that members will adapt their dress to meet the same time-scale as the recipes which will be served. This ranges from the time of the Emperor Tiberius (14­ - 37 AD) to the start of the First World War (bustles and all that). We are, by the way, extremely-sorry that we are not offering any prehistoric dishes in the buffet: but the problems of cooking a soup by throwing in heated pot­boilers or making a stew in a sheepskin stretched between four poles has proved difficult to achieve in Hampstead Garden Suburb - even for the talented Corps of HADAS Cooks. What we are trying to say is: don't come dressed as usual. Be ingenious and add to the gaiety of the occasion be wearing something different, preferably historical - or even just a funny hat. How about sporting a wimple or a snood, a helmet or a stove-pipe? Or you could do worse than just toss your toga or tunic into the washing machine and turn up in Roman style again. However you choose to come, there will be a warm - and, we hope, delicious- welcome. In the December Newsletter we published a report on HADA's visit to Barnet physic well. On that occasion TED SAMMES took samples of the well-water for analysis: below is his report. All spring and well waters contain dissolved mineral matter to some extent. This has been obtained from the "rocks" through which the water has travelled from the land surface to the interior and back to the surface. The water of Barnet Physic Well is no exception. The analysis of the sample taken on 6 November 1981 showed the water to have the following composition in milligrams per litre. Our Bacteriologist concluded that due to slight faecal contamination the water would not be classed as satisfactory for drinking without chlorination. I was first down the steps and took the samples into sterile bottles before the rest of the party descended. The conclusion is not surprising, since the water was very still (we visited in a dry period) and its level only about 10-12 feet below the present land surface. In such conditions contamination could easily have crept in. Jane Butler in HADAS Newsletter No 48*, February 1975, reported an analysis made by Dr Trinder in 1812 (I have converted his results, given in grains per gallon, to milligrams per litre, by multiplying by 14.28). For the first three chemicals the two analyses show surprising agreement. Taking the major constituent, Epsom Salts, the dose range in the British Pharmacopoiea is 5 to 15 grams. To obtain the minimum dose one would need to drink in the region of 4 litres (7 pints)! were pint ones it makes a lot of sense. The craze for well waters started in the 17th century and continued into the early 19th century to be killed off by the craze for sea-bathing. In fact the date quoted for Dr Trinders analysis in HADAS Newsletter 48 was 1912; but in Newsletter 51 Jane Butler corrected this to 1812. Tunbridge Wells was discovered in 1606 by the then ailing Lord North who recognised in the water a similarity to that which he had seen at Spa in the Low Countries some years previously. Barnet was discovered in 1650 and was advertised in the Perfect Diurnal of 5 June 1652. Pepys second visit was on 11 August 1667 when he afterwards went to the Red Lion. There were other wells in our vicinity at Hampstead, which was chalybeate (iron bearing). Kilburn was partly so and other wells have been noted at Cuffley, Welwyn, Totteridge, Muswell Hill, Islington and Sadlers Wells. As time progressed these became amusement parks with a well/spring and many died out. That famous traveller Celia Fiennes, visited Barnet, but finding the well full of leaves and the water coming up dirty when drawn, did not drink. Barnet survived until 1840 when it was demolished only to be resurrected in the early 20th century as a curiosity! Addison W. English Spas. Batsford 1951. Potter G. Hampstead Wells., pub. 1904. Reprinted Camden History Society 1978. Braybrooke. 1876 or Wheatley H.. 1949. Vol. IV. The Physic Well at Barnet. H.A.D.A.S. Newsletter No.48. Feb 1975. For anyone curious enough to search out the site of the Kilburn Well its site is within the angle formed by Kilburn High Road and Belsize Road. In 1947 there was still a stone tablet let into the wall recording this fact. My thanks are due to the Directors of Weston Research Laboratories Ltd for permission to carry out this work. In an outstandingly interesting and informative lecture, John Clark, author of the Museum: of London's excellent booklet, Saxon and Norman London, gave us an account of the history of the city between the fifth and the thirteenth centuries - a period which he said, he felt to be the most intriguing in all London's past. He began by describing Britain after the Roman withdrawal of troops in 410 A.D. Left undefended the Anglo-Saxons began to arrive, first as invaders and then as settlers. At its best, theirs was an Iron Age civilisation they shunned towns, preferring to live in the countryside. Roman London, which may well have been experiencing a recession as early as the second half of the fourth century, despite its new and elaborate river wall, fell into decay. With its twin purposes of government and trade both in abeyance, it must have become a ghost town with a population of near-squatters living within the walls which no longer encircled anything worth protecting. The progressive dilapidation of the Roman house excavated at Billingsgate demonstrated that London decay was gradual and that there was no sudden, violent catastrophe. By the eighth century, there had been a resurgence. The Venerable Bede, writing about 730 A.D., described the city as 'the mart of many nations'; by the third quarter of the ninth century, Alfred the Great had halted the Viking invasions; he proceeded to put the walls of London in good repair. Officials, such as the port-reeve, later known as the sheriff, and the aldermen, made an appearance; city life was regulated by the folk-moot and the busting. The contingent from London acquitted itself well at the battle of Hastings and the Londoners were able to drive their own bargain with William the Conqueror. By the 1140s, their descendants were beginning to assert their right to elect a mayor and to form themselves in­to a self-governing commune, a right that was confirmed by King John shortly before he was constrained to sign Magna Carta. The City Seal was struck, showing St. Paul with drawn sword against a background of imposing buildings. Mr Clark then described how the medieval city adopted a noble origin for itself; - Geoffrey of Monmouth's version of its foundation by the much travelled Brutus as New Troy. He concluded, more realistically with William FitzStephen's proud description of the city which he knew and loved and which had nurtured Thomas a Becket; a city with good government, fine buildings, energetic apprentices skating on the ice-covered marsh beyond Moorgate, and an excellent 'take-away restaurant' beside the river, should its citizens need to deal with unexpected guests; a city of which it could truly be said that it spreads its fame wider, sends its wealth and wares further, and lifts its head higher than all others. As 1982 is the 21st anniversary of the foundation of HADAS, we hope to involve as many members as possible in the celebrations. School members (4 schools are corporate members of HADAS) have been asked to take part in a poster competition to produce a poster on an archaeological or historical theme. The title chosen is 'Scenes from History," and artists can choose to illustrate any period either in prehistoric or historic times, from early cave-dwellers down to a scene from industrial archaeology of the turn of this century. Individual Junior (under-18) members are also eligible to enter the competition and this is a cordial invitation to them to do so. 1. Posters should be either double crown (20" x 30" or crown size (15" x 20"). 2. They can be the work of a group of students in a school or of an individual artist. .3. Each school can submit several entries if it wishes individual Junior members of HADAS may submit up to three designs each. 4. Entries should reach Mrs Grafton Green by March 31, 1982. As regards School members, HADAS will provide a prize, worth £10, for the school from which the winning entry comes. As regards Junior members, there will be a small prize if a Junior member wins. A selection of entries will, it is hoped, be on show at the 21st Birthday party on April 24, 1982, which will be attended by the Mayor of Barnett Mrs Rosa Freedman. It is also hoped to show entries at the AGM in Hendon Library on May 11, 1982. If any problems or difficulties arise in connection with the competitIon please contact the Hon. Secretary. HADAS member Dr Ann Saunders, who talked to us in November about the history or Marylebone, will be lecturing on, Feb 16 at Bedford College, Regents Park, NW1, on "Marylebone Park 1537 - 1811." Lecture starts at 5.15, but if you go along a bit earlier you can have a free tea, being served from 4.30 on! HADAS members, Dr. Saunders assures us, will be most welcome. Many thanks to the, members who kindly responded to the invitation in the December Newsletter to help re-instate Barnet Museum: Alec Gouldsmith, Brigid Grafton Green, Audrey Hooson, Isobel McPherson, Andrew and Joan Pares, and Linda Webb. Their names have been passed to the Curator, Bill Taylor, who asks us to express his thanks and to say he will be in touch with volunteers in the next month or so to give details of when and what, help is needed. Meantime if any other members would like to add their names to the list, please let Brigid Grafton Green know. In-the October newsletter we mentioned the special-interest group which Mrs Beatrice Shearer is hoping to form for everyone working on documents concerned with population history in London - parish registers, census records,. manor court records, surveys, etc. The inaugural meeting of this group will be held on Sat. Feb 6 at the Museum of Landon from 10.30 - 12.30. There is an open invitation to all interested local historians to attend. Congratulations to HADAS member Andrew Pares who was awarded the CBE in the New Year Honours, for political and public service in London. Mr Pares and his wife, Joan, joined the Society seven years ago and have been keen supporters of our lectures and other activities ever since. Mrs Pares is one of the hard-working team which has been processing the West Heath finds. Mr Pares, who still holds many offices in voluntary bodies in the.. Borough, was:Mayor of Barnet in 1976-7, and in that capacity officially opened the HADAS exhibition "Archaeology in Action" at Church Farm House Museum on Feb 19 1977. He was the inspiration and founder-chairman of the Barnet Voluntary Service Council, to which we are affiliated. We rejoice with him in this well-earned honour. The account in the HADAS December. Newsletter of Anthony Salvin and his work was most interesting. Your readers may like to know that Salvin designed 'two schools in what is now the borough of Haringey. One, St James', Tetherdown, in Muswell Hill was demolished some years ago, but the other, St Michael's Primary School, Highgate (1852) can be seen today from North Road. Salvin's original buildings have been recently converted to a nursery, and infant section, a new junior school having been constructed a little distance away, and the facade including the belfry restored. All those in charge of Workshops are members of the Museum staff. And should you be in the Museum, don't forget to look in on "London's Flying Start", where there is much to interest members in the recent history of our Borough. The exhibition goes on until May 9. Admission charges are adults 60p; children, students and pensioners, 30p. HADAS members, under the leadership of Paddy Musgrove, have been excavating the cellar passage at Manor House, East End Road. A report is being prepared. The Victorian rectory of St. Mary-at-Finchley, Hendon Lane, N3, designed by Anthony Salvin, (1) was demolished in 1973 (2) and replaced by a modern rectory in the western portion of the then extensive gardens. Surface finds made during the rebuilding period included 17th century stoneware and a number of small yellow paving bricks, similar to those found elsewhere in the Borough of Barnet (e.g. at Burroughs Gardens and Church Terrace, Hendon) and thought by the Guildhall Museum to be of 13th/14th century date (3). Some of these were found in isolation; others had been reused, together with bricks of much more recent date, to make a garden path for the Victorian rectory. When the Rev. T. Reader-White, founder of Christ's College, was appointed rector in 1848, one of his first acts was to demolish the old rectory, then standing in what is now Rectory Close, and to build his new rectory on land to the north, known as the "Old Orchard" (4). The Tithe Map of 1841 shows the old building was of eccentric plan and abutting onto the boundary of the church­yard directly facing the tower of the church (Fig. 1). Reader White's predecessor, Ralph Worsley, whose wife inherited Moss Hall, chose to live in Nether Street rather than in the old rectory (5) a possible reflection of the age or condition of the building, of which we have various descriptions. C. O. Banks, in a manuscript "index" held in the Borough of Barnet's Local History Collection, states that the old rectory was "a whitewashed house that stood facing the west tower of the church". He further records that "in the spring of 1939 Frank Marcham wanted to sell 2 very fine water colours of the back view of the rectory looking from the corner of the north outside aisle at the west end, It stood in a direct line facing the tower and overlooking the churchyard. The red bricks of the east side of the rectory formed the boundary of the churchyard". Unfortunately, we are not told the date of Frank Marcham's pictures, nor do we know where they are today. Although the descriptions vary widely, their references to the positioning of the building are all compatible with its location shown on the 1841 Tithe Map. The odd outline shown in that map could well indicate a building assembled in bits and pieces over a long period and appearing to both Ralph Worsley and Reader White as of such antiquity or decrepitude as to persuade them to live elsewhere. The relevance of all this to the trial trenches opened by HADAS in the rectory garden in 1978 lies in the fact that our investigations in the "Old Orchard", reported below, yielded large quantities of dumped building materials which, although of different periods, had all been deposited in the mid-19th century, i.e. around the time of the demolishing of the old rectory and the building of Salvin's new one. During April and May of 1978, three small trenches (A, B and C in Figure 1) were opened, Trench A measured 4 metres by 2 metres and B and C were each 2 metres square. Their locations and dimensions were largely dictated by the need to avoid areas soon to be taken over by builders. St Mary's church contains a 12th century font (dug up in the rectory grounds (7) sometime last century and subsequently stored variously in the Church belfry, "the back garden of Mr Wells, Ballards Lane, ... occupier of Mr Plowman's House (builder)" (8), and the rectory stables. (9) The church itself is referred to in 1274 (10), but fragments of earlier Norman masonry are built into one wall. The purpose of the excavation was to seek further evidence of this early occupation. In the event, pottery dating from the 12th century through to the present century was indeed found. The most common finds in all three trenches were, however, fragments of hand-made roofing tiles, bricks and other builders' rubble including thick painted plaster from lath and plaster walls. Trench A showed five separate layers of made-up material, but here, despite their substantial content of medieval and other pro-Victorian pottery, the creation of all these layers can be dated by clay pipes and blue-and-white crockery to the 19th century at earliest. At the north of the site, the natural land surface slopes to the north­west down to the Dollis Brook and here, in trench C, it became clear that, also around the time the Victorian rectory was built, a substantial "terrace" was created along the slope of the hill, partly for garden landscaping, but also to provide level land around Salvin's new rectory building. 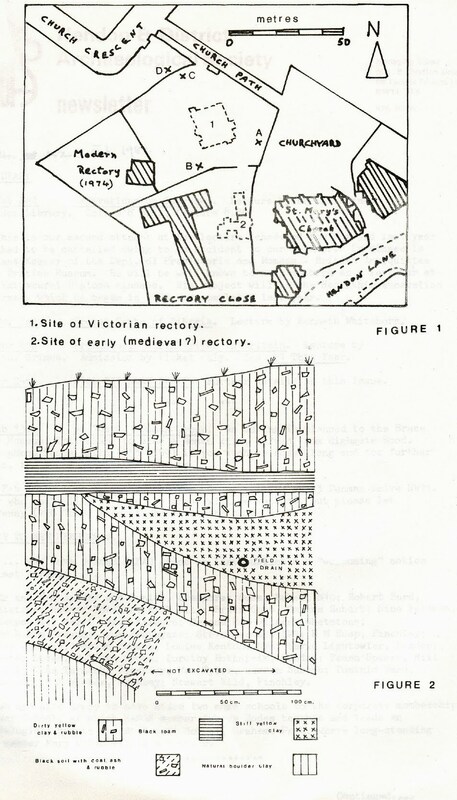 Figure 2 shows a section of this "terrace" build-up exposed in trench C. The section of field drain shown was in situ. With exterior and interior diameters of 2½ ins. and 1½ ins., the pipe is of a type which came into use about the mid-1840s. (11) his drain (and probably others) would have been needed to prevent surface water being dammed up behind the new raised "terrace". Also, from the same layer, a clay tobacco pipe made by George Andrews, who was working in Highgate in 1845, helps to establish the approximate earliest date of deposit. In this trench, as in trench A, medieval pottery was found at all levels, as also were objects of 19th century date. It is reasonable to assume, therefore, that the "terrace" was built up largely from materials deriving from the demolished early rectory. In the area of trench B we found that recent work by builders had removed all top soil, leaving only 21 cm., of dirty, yellow, gravelly clay on top of the undisturbed natural, but even this contained much rubble, together with oyster shells, post-medieval pottery and a single flint struck flake, one of five flakes of-probable Mesolithic origin found on the site. These, together with the chief pottery and other finds, will be described in the second part of this report, which will also deal with the features discovered in trench D.
5. Victoria History Middx., VoL VI. 6. Home Counties Magazine, Vol. III, 1901, p. 288. 7. Guide displayed in St. Mary's Church,. 8. W. Bolton, Home Counties Magazine, Vol. XI, 1909, p. 75; A. Heal, ibid.